Intel has announced the first two processors using its new Skylake microarchitecture: the Core i5-6600K and the Core i7-6700K. Both of these 14nm chips are aimed at desktop PC gamers and people still overclocking their machines. The components form an outrider party for Skylake as more chips using the microarchitecture are due to arrive later this year. Skylake is the latest step in Intel's tick-tock pattern of turning semiconductors into cash money. 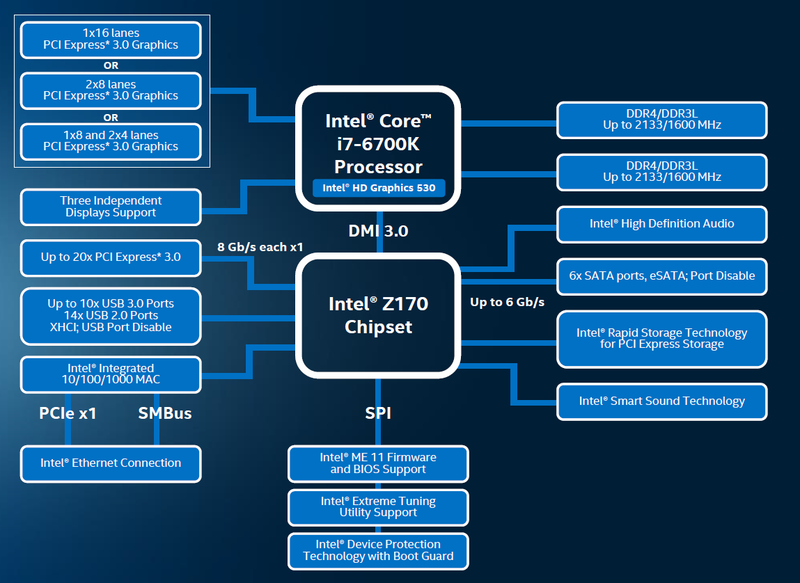 Chipzilla shrank its processor gate size to 14nm with the Broadwell family (the tick), and is now producing Skylake chips on that process size (the tock). No one remembers Broadwell. The nitty-gritty details of the new Core i5 and i7 processors, and the rest of the Skylake family, will be revealed at this year's Intel Developer Forum in San Francisco, which is due to start on August 18. The new pair of chips were unveiled at Gamescom in Germany on Wednesday. For now, this is what we know about the two Skylake-K Core processors, and as we will see, you will need a new motherboard and set of RAM sticks to install and use these suckers. This is a quad-core processor clocked at 4GHz. It can turbo up to 4.2GHz. Intel hasn't moved the needle on its desktop clock frequencies for years. Last year's Haswell-based i7-4790K can go as high as 4.4GHz, and previous generations have hung around the 3.5GHz mark. The new i7-6700K has eight hardware threads, and an 8MB L3 cache, as seen in previous generations. It kicks out 95W of heat, compared to the Broadwell family's 65W and Haswell's 84W. It needs DDR3L 1600MHz or DDR4 2133MHz RAM; it has 16 PCIe 3.0 lanes; and its builtin Intel HD Graphics 530 GPU can output a resolution of 4096-by-2304 pixels at 60Hz over HDMI 1.4 and DisplayPort – 4K, in other words. The processor fits into a FCLGA1151 socket. Intel recommends a $339 to $350 price tag. This is a quad-core processor clocked at 3.5GHz. It can turbo up to 3.9GHz. It has four hardware threads, and a 6MB L3 cache. It kicks out 95W of heat. It needs DDR3L 1600MHz or DDR4 2133MHz RAM; it has 16 PCIe 3.0 lanes; and its builtin Intel HD Graphics 530 GPU can output a resolution of 3840-by-2160 pixels at 60Hz over HDMI 1.4 and DisplayPort. The processor fits into a FCLGA1151 socket. Intel recommends a $243 price tag. Wait, what's an LGA 1151 socket? What about the RAM? Every couple of generations, Intel changes the physical socket needed to plug a processor into a PC motherboard. The fifth generation uses an 1150 socket, and these new sixth-generation chips require an 1151 – so, you'll have to change your motherboard to one with a 1151 socket to use these new Cores. While 2133MHz is the top limit for DDR3, DDR4 starts at that speed, so the only way is up. DDR4 RAM also has a higher capacity: 16GB sticks are available for this memory type, so a motherboard with space for four modules can have up to 64GB fitted. So, having to fork out for a new mobo is not all bad news: it's needed for the socket, the DDR4 RAM slots, and the power routing requirements of the Skylake chips. Plus it gives you the opportunity of picking up a motherboard with an overclocking-friendly Z170 chipset [PDF brief], which is also new today. The chipset supports the fine-grain overlocking features of the new Cores – the chips are unlocked so their performance and ability to fry an egg can be ramped up: the new i7's clock can be finely incremented in 1MHz steps, for example. The silicon also offers up to 20 PCIe 3.0 lanes, up to 10 USB 3 ports, gigabit Ethernet, support for 2133Mz DDR4 RAM, six SATA storage drive ports, and other bits and pieces. The extra PCIe lanes mean you can comfortably squeeze in M.2 flash drives and a GPU card, more so than the bandwidth-hamstrung Z97. The bandwidth between the chipset and the processor has been upped to 8 billion transactions a second, or about 3.9GB/s in real money, so peripherals aren't starved of data. All in all, a lot of extra doodads for a small increment in raw processor performance over the previous generation. Another five per cent, or worse, increase in IPC, and a lukewarm can of soda in the engineering cafeteria to celebrate. PS: Intel says it's also going to flog unlocked Skylake-K chips for laptops, so you can overclock your processors right there in your lap. Great for winter! Perfect for infertility!